There is truly nothing like sitting around a fireplace. In our opinion a fireplace can tranform a house into a home and although these days many people feel that large flat screen televisions are the focal point of a living room, you will never replace the allure and lusture of a fireplace with a television (and hanging your Christmas stockings off a television just isn't the same!). Here at The Marble Warehouse we understand that everyone has different tastes and every house is different. This is why we strive to give you the best possible service with our bespoke fireplaces - from the design, to the size and colouring of your choice. The Marble Warehouse is perfectly positioned to provide a unique and wide ranging service. We have adapted to many changes in the industry over the years. From slabbing ceramic tile fireplaces for solid fuel coal fires we have progressed through the evolution of gas flame effect fires in Adam Style Wooden Mantels, through Electric Fires and Electric Suites to Carved Marble & Stone Fireplaces. We offer a standard range of stone fireplaces and timber mantles in standard sizes - which for the large part will suit most people's homes. However, some people may not have chimneys or fire openings, some people may have a breast wall, others may only have a flat wall (which is pretty much indicative of most new build houses), and some (lucky) people will have expansive inglenooks - we can adapt our designs to suit. We have extensive showrooms with over 80 live displays and we would definitely recommend paying us a visit! 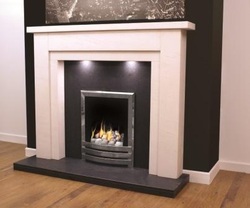 Please see our stone fireplaces gallery and timber mantles gallery for more ideas.